The Agile Manifesto states that “Working software over comprehensive documentation” but this does not mean that there should be no documentation at all. Especially for agile software projects where the architecture might adapt to new knowledge, market situations or technologies it is important to know what decisions were made, why they were made and with which assumptions. The main problem with documentation is, that it needs to be close to the project and it needs to be short and concise or else it won’t be read or won’t be updated. What are significant decisions that we should document in this scope? 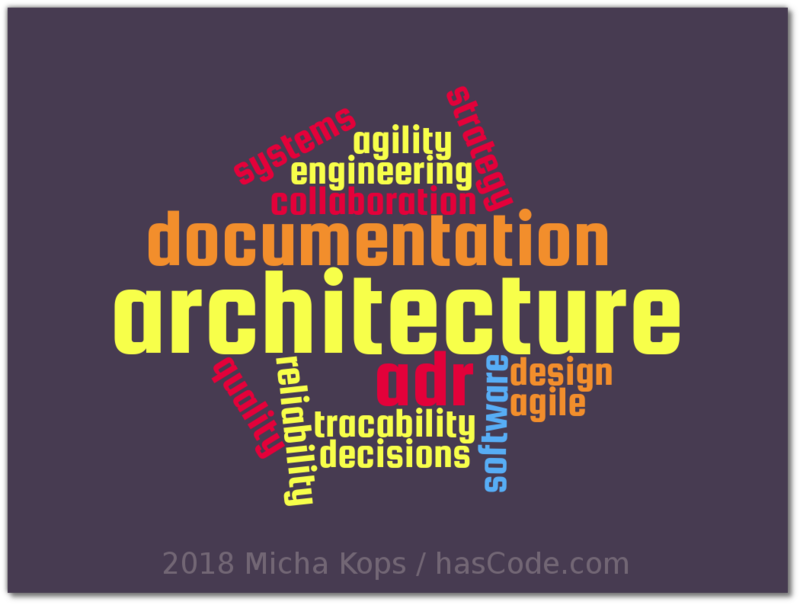 Therefore each record describes a set of forces and a single decision in their response, forces may appear in multiple Architecture Decision Records (ADR) and we store them in our project directory in doc/arch/adr-NNN.md and we number them sequentially and monotonically. When reversing a decision, we keep the old ADR file but we’re marking it as superseded because it still might be relevant to know that there was such a decision. Title: The ADR file have names consisting of short noun phrases, Example: ADR 1: Use Hystrix to stabilize integration points. Decision: The response to these forces, active voice, full sentences. Consequences: The resulting context after applying the decision with all consequences, positive as well as neutral or negative ones. For more detailed information, please feel free to read Michael T. Nygard: Documenting Architecture Decisions. Of course other formats for ADRs exist, please feel free to visit https://adr.github.io/ for other tools and formats. We will be using ADR-Tools to manage our ADRs so we need to install it. Another choice e.g. for Linux is to download the latest release from GitHub here, untar the archive and add the src-path to your PATH. ADR-Tools are a collection of bash scripts. The first step is to initialize ADRs for our project (in this example it’s a typical Maven project). We use adr init to initialize ADRs for our project within the specified directory …..
As we can see, a first decision already has been added to the project: It’s the decision to record our architecture decisions. We’re ready now to create our first ADR. The command adr new allows us to create a new ADR with the given title. This produces the following new ADR file with a reference to the superseded ADR. Of course our old decision is changed, too including a reference to the new ADR and setting its status to “Superseded”. Another choice is to use an online tool like webgraphviz here so you don’t need to install another tool. When ADRs are linked somehow we want to document this and adr link eases this for us. $ adr link 4 Amends 2 "Amended by"
This entry was posted on Sunday, May 27th, 2018 at 8:19 pm	and is filed under Development, Enterprise. You can follow any responses to this entry through the RSS 2.0 feed. You can skip to the end and leave a response. Pinging is currently not allowed.